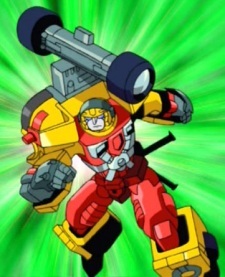 Hot Shot "Hot Rod, Exillion, Exigeyser, Hot Rodimus"
Hot Shot is the quintessential young hero. He's been around long enough to earn a name for himself and a place in Convoy's (Optimus Prime's) entourage, but he's still too young to know when he's in over his head. In other words, he's blunt, overconfident, naïve, and more than just a little annoying, yet brave, honorable, loyal to his friends, and willing to risk his life to stop the Destrons (Decepticons) and help the Cybertrons (Autobots). With time and experience, Convoy believes, he could make an excellent leader, and Convoy has appointed him to his command structure accordingly. Hot Shot's got the goods, but he just needs to pay attention for more than five seconds. Until that day, Hot Shot's likely response to most anything is, "Yeah yeah, like, whatever."